Dinosaurs and Robots posting was rather light last week as Mark and I were at Maker Fair - busy napping under trees from Bakersfield to San Mateo. It was my intent to 'live blog' from the fair but my duties were not insignificant and I selfishly used every free moment to experience the awesomeness. Maker Faire is certainly the geek paradise that is portrayed in the media, but that is a description that is too limiting to explain what is really going on. 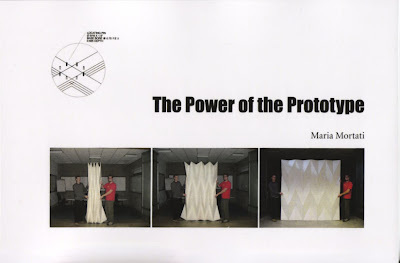 One of my favorite exhibits was The Power of Prototype by Maria Mortati. 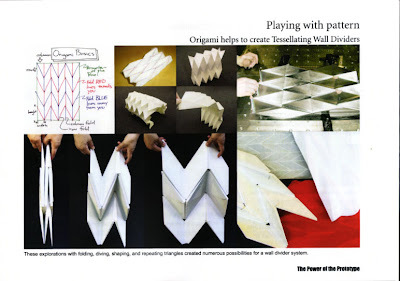 As a professional curator, her creation was a small scale museum exhibit on the importance of prototypes. A proletariat, mass consumer product like a Glade fragrance spritzing machine is not classically inspiring, but Mike Strasser's foam core prototype is completely captivating when you are able come face to face with the original idea. One wouldn't think there would be a celebrity quality to prototypes but, when you have the singular relic in your hand, it is easier to be awed by a fragrance dispenser than you would think. As a curator, Maria selected a breadth of objects to make you realize that prototyping is a tool of the creative process and not a mere instrument of corporations refining manufacturing. 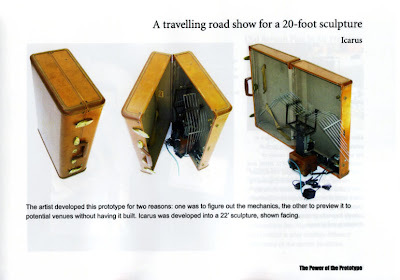 Kal Spelletich's compact monster in a suitcase was a terrific example of the prototype as a finished product. Sure, I imagine the full size flame spitting beast was exhilarating to see, but the salesman sample version inspires an immediate narrative of a Music Man-type charlatan roaming the countryside with small town dreams of locals owning their own monster. Why did Maria go to all the trouble to curate an exhibit - complete with a catalog - for Maker Faire's run of only two days? And what about it being drowned out by Tesla coils and the seemingly ever present chattering of R2D2? I imagine she created it for the same reason as everybody else at Maker Faire. She thought it needed to be done.